During my growing up years (yes, many moons ago) there was an India Today article on Delhi Campus lingo. This was of course years before the advent of mobile phones and sms language( brb, btw would have been dismissed off as gibberish in an era where people spoke only the Queen's language). So the author had written with some amusement about how college students were getting into the habit of shortening everything and the traditional syrupy sweet Gulab Jamuns were being referred to as G Jams. This was also around the time when burgers and Pizzas were making their entry into India and I guess the traditional fare had to quickly re-invent itself(nomenclature change seemed like the quickest and easiest) to compete in times where anything Western was hip and happening. Yes, much has changed today(Jai Ho!) and there is pride like never before in everything Indian. Coming back to the article, me and my siblings in small town India were suitably impressed and started to use them in our conversations. In any case it was soon part of College lingo in most parts of the country. Whether I referred to them as Gulab Jamuns or G Jams they have been a personal favourite(they come second only to piping hot, crisp Jalebis). In fact during a recent holiday when I refused Gulab Jamuns(part of the buffet dessert spread), the boys exchanged hurried glances and realized that Mom was indeed angry. I heard the younger one whisper " but she never says no to Gulab Jamuns". They seem more perceptive than husband dearest. I have always had the store bought/mithai shop stuff. Would microwave them for 30 seconds and try and resist having more than one. Even when I have eaten it at other people's homes these have invariably been bought from the local mithaiwala. I did sample some "homemade readymix" types and I am sorry to say but they are not a patch on the original. And even the best of the chefs have never managed to get it to taste like Gulab Jamuns( either a soggy, lumpy consistency or rock hard balls in a thin watery syrup). So I was really fascinated when my friend R told me that she made her Gulab Jamuns from scratch and they tasted really good. While R is a very good cook but I was still not convinced if she had managed to get this one right. 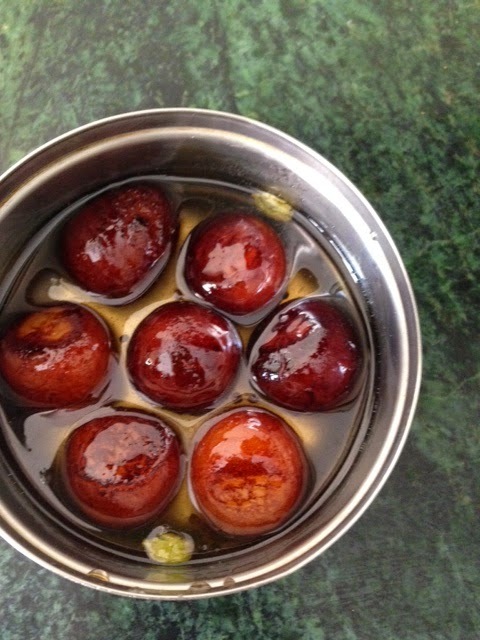 So we fixed a lunch date and after a delicious meal we set out to make to make the Gulab Jamuns. She had already done the basic preparatory work of soaking the Sooji(Semolina) and measuring out all the other ingredients. And I was an eager and helpful assistant. I did the mixing and kneading and made the G Jams under her expert guidance. The most difficult part was the " standing time" as R called it where you put the fried balls into the syrup and wait. It is hard and maybe the best thing for you to do is to go take a walk( literally). It was worth the wait and I greedily helped myself to a couple of them. They tasted delicious and are near perfect. Soak the Sooji in water- just enough to cover it for about two hour. The Sooji should have soaked up the water by the time you start the actual cooking. Thaw the Khoya in the microwave for about 30 seconds( if you have stored it in the refrigerator and I would strongly recommend you do as it would tend to spoil). Knead the Khoya and Sooji together for about 15/20 minutes. They should come together like a softer roti dough and there should be no lumps. Make small balls out of the dough- you should get anywhere between 22 and 25. Fry the balls in medium flame till they turn dark brown and keep aside to cool down. Make the sugar syrup( this takes a while so I would suggest you let the sugar syrup simmer before you get started with the kneading) by adding the two cups of sugar to about three cups of boiling water, add the green cardamom, let the syrup thicken on low flame. When the syrup starts to thicken check if it is done by taking a little bit between your thumb and index finger(watch out it will be hot- so take some in a spoon, blow it for a few second first and then check)- as you try and separate your finger you should see a thin string kind of thing( " ek taar" as it called in Hindi) then you know it is done. Drop the balls into the syrup and give it about an hour of standing time. 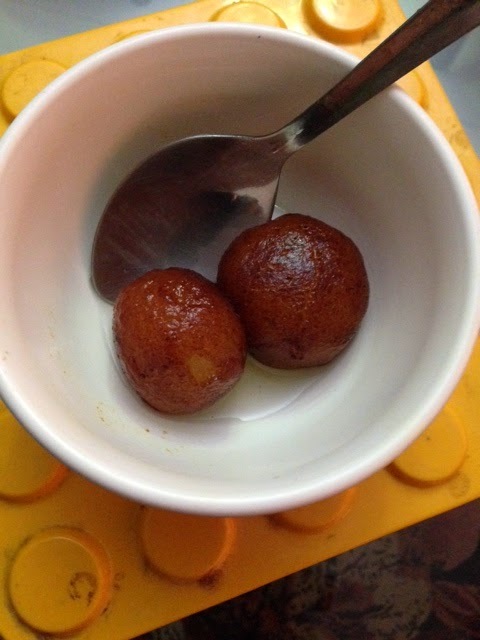 And then help yourself to some freshly made, warm Gulab Jamuns. Close your eyes and feel them just melt in your mouth. Store them in the refrigerator in an airtight container. These keep well for days(so hot, cold or in the pot seven days old) but let me see how you get them to survive beyond day two- yes, it is a challenge! You could serve them with Vanilla ice-cream or even custard, halve them and top it with malai and nuts(like Malpua). But I like my G Jams just by themselves. Bon Appetite! Happy cooking and happy eating. Happy me at the end of this post.